Michael Jackson | What's Peeps Thinking About Now? It's Probably Random! Spring is here and this is my first random thoughts blog since returning from Bangkok, Thailand. This is my favorite picture that I took there! I love koi! If you missed the pictures or the details of that enlightening trip (even with the rat and the snakes), here’s the link. It’ll open in a new window! It’s always nice to get away, but it’s nice to come home. Now I’m ready to enjoy the nicer weather heading our way. Thank you for taking the time to check out my random thoughts and have a great weekend! This is the four-hour documentary on HBO that’s everybody’s been talking about regarding Michael Jackson and child sexual abuse allegations. Choreographer Wade Robson and former child actor James Safechuck, now adults, talk extensively and graphically about the sexual abuse they suffered when spending time with Michael Jackson. I’m going to make some comments and I’m going to keep the sentences short, so there’s no misunderstanding or taking things out of context. I believe Robson and Safechuck! As a parent, I’d NEVER allow my child to spend nights with a man in his 30s. Where was the parental supervision and let’s talk about the lapse of judgement there — I don’t care if Jackson was the biggest star on the planet! If Jackson was alive today, I’m not sure he’d give details of what did and didn’t happen with those boys, who were around 7 and 10-years-old when the alleged abuse started. I do wish that the director had reached out to a Jackson family member since Michael is dead and couldn’t speak for himself. But, we know they’d just say it didn’t happen and the two men are out for just money. By the way, Robson is a multi-millionaire! “Leaving Neverland” is definitely worth seeing — if you can handle the graphic content! And, yes I’ll listen to Michael Jackson’s music today. He’s a musical genius! However, I have no desire now to watch his videos again!!!!!!!! I absolutely love Julia Roberts and Lucas Hedges is one of my favorite current young actors. He was fantastic in “Manchester by the Sea” and “Boy Erased”. And, he’s so adorable! I’ve really been wanting to see this movie, but I don’t recall it playing in Duluth, Minnesota, where I live. If it did, it was brief and I missed it. The movie is about Ben returning home for the holidays after a stay in drug rehab and trying to stay clean. The trailer is compelling, but the movie is so much better and more intense! Now I don’t believe in spoilers, so I won’t say if it happens or not. But, Ben, I know you’ve watched horror movies and you should know never to say anything like “I’ll be right back”! As you’ll see in the trailer, Ben says, “I’m not going to die”! Reba McEntire is back and I really think that country radio is finally going to give her another chance. Her new single, “Freedom”, makes its debut on the Billboard Country Airplay chart this week at #52! Sadly, Reba’s last Top 10 hit at country radio was “Turn on the Radio”, which topped the chart in January 2011! What? That’s eight years ago! “Freedom” is being called “euphoric” and a “fist-pumping anthem”! It’s the first official release to country radio from her new album, “Stronger Than The Truth”, which comes out April 5, 2019. If you don’t watch “9-1-1” on Fox, what are you waiting for? You’re missing a great show that’s really entertaining. And, two recent episodes — the winter finale and first episode back from the holidays — were the series’ best! Earlier this week, Fox renewed “9-1-1” for a third season! Spoiler alert, “Green Book” won the Oscar for Best Picture! I’ve seen five of the eight nominations from this year (I still need to see “The Favourite” and “Vice” and I won’t watch “Black Panther”. I’m not a Marvel fan and if I can’t get through the Captain America movies with my future ex-boyfriend Chris Evans, I won’t be seeing “Black Panther”! Bummer because I love Angela Bassett!). I enjoyed “Green Book” and the acting was superb. However, I wouldn’t watch it again unless I was in a group and they wanted to see it. I think the talk of the movie’s racism was overblown. I didn’t see it as a movie where the white man saves the black man. I think it was a movie of two people becoming friends and enlightening each other. Yes, it had racial stereotypes in it, but it was set in the early-1960s South! Best Picture, no! Of the five I’ve seen, so far, I would have voted for “Bohemian Rhapsody”! I love Ryan Gosling and Claire Foy is incredible (“The Crown” seasons one and two)! And, director Damien Chazelle’s “La La Land” was awesome, so what is this? I almost stopped the movie within the first 30 minutes! While it does have some great drama (at times) and it has some great special effects, it seems so disjointed. Bon Jovi sings, “You Give Love a Bad Name” and “First Man” gives space exploration a bad name! Ava Max is a musical newcomer from Milwaukee, Wisconsin. But, her song, “Sweet but Psycho” has already topped the charts in at least 22 countries. It also hit #1 on the Billboard Club Songs chart in the U.S.! The song has a very European sound to it, which is probably why it’s my favorite current song. Ava Max is definitely channeling one of her idols, Lady Gaga in this video and with her voice! “Sweet but Psycho” has been viewed almost 234 million times! Have a great last weekend of February! Millions will be tuned in Sunday night to see the best of Hollywood (at least those nominated and chosen) accept their awards and make political speeches. I’m basing my picks on my “entertainment” knowledge. The only nominated movies and performances I’ve seen, so far, in the top categories are “Arrival”, “Captain Fantastic”, “Florence Foster Jenkins”, and “Hell Or High Water”. Best Picture: “La La Land”. I saw “Arrival” and it’s definitely not going to be that one. Best Actor: Denzel Washington. If not, it’ll be Casey Affleck. However, I’d love for it to be Viggo Mortensen. Earlier this week, at least 74 bodies of migrants washed ashore from the Mediterranean Sea in Libya. Libya is a North Africa country on the other side of the world that I’d never want to visit, even if it borders the beautiful Mediterranean Sea. It’s a country strife in human rights violations and political regimes. While it’s so far away (and tragedies like this one are a frequent occurrence), it’s gotten minor news coverage. Sadly, many across the rest of the world probably had little concern about it as it crossed their online news feeds. But, for some reason (maybe since I’m pontificating about life and my future), it really hit me. I didn’t know those people and I know things like this happen. Yet, those people yearned for something better. They were willing to sacrifice the most prized gift we’re given — life — for it. What it all comes down to is that those people were someone’s loved ones! It’s no secret that I’ve never been a Caitlyn Jenner fan. While she’s educating herself more and making progress, I still feel she’s out of touch with what life is really like for the average transgender American. However, “from, well, one Republican to another”, she’s finally stepping up and speaking out against U.S. Attorney General Jeff Sessions and her “friend” in the White House. While I say “kudos” to Jenner on this, I’m still shaking my head to think that she didn’t have the foresight to see this coming! This leads me into part two of this thought process! 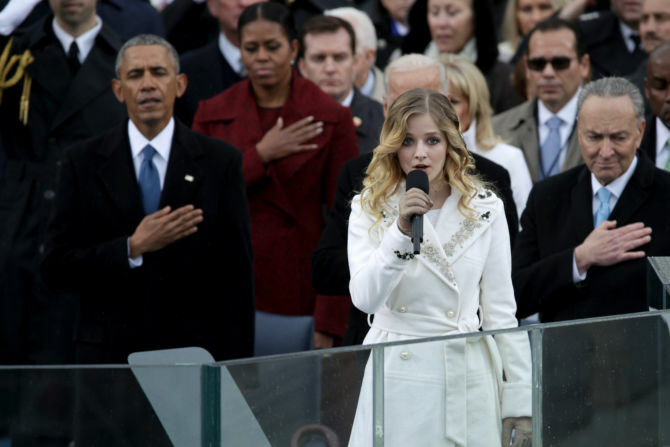 16-year-old classical singer Jackie Evancho sang the National Anthem at the Inauguration of #45 last month. To those familiar with her, this was a little (or a lot) confusing since her sister, Juliet, is transgender. It probably wouldn’t be a stretch to think of how the new administration would feel about LGBT rights, specifically transgender rights. Earlier this week, the president rolled back federal government protections allowing transgender students to use the bathroom associated with their gender identity. Evancho reached out to #45 via Twitter: “I am obviously disappointed in the @POTUS decision to send the #transgender bathroom issue to the states to decide. #sisterlove“. So far, she hasn’t heard back from him. What are your thoughts? I’m torn. Maybe she performed to make a connection to discuss her sister and transgender rights? Or, did she do it for the publicity and a possible bump in record and concert ticket sales? Before the performance, she and her family were questioned about the new administration’s views and her transgender sister and they basically said that it’s a performance and not political. Well, I do have issues with that one. It is political! As I mentioned last week with the passing of French actress Emmanuelle Riva, real life gets in the way and I miss some things (even with real news and fake news on Facebook). I was saddened to learn that jazz, R&B, and pop legend Al Jarreau died the weekend before Valentine’s Day at the age of 76. He was born in Milwaukee, Wisconsin, and didn’t release his first album until he was 35 years old! If you’re not a jazz or R&B music fan, you’ll likely remember him singing the theme to the late-1980s ABC hit show “Moonlighting” with Bruce Willis and Cybill Shepherd. Jarreau charted 11 Top 40 hits on the R&B chart with four reaching the Top Ten. On the Billboard Hot 100, he had three hits. The “Moonlighting” theme reached #23 in 1987, but “We’re In This Love Together” from 1981, my favorite, was his biggest. It reached #15. Throughout his career, Jarreau won seven Grammy Awards and was nominated for 17 more. When I find myself stressed or really bummed out, Christmas music always snaps me back into reality. The past few weeks have been rather stressful and Wednesday morning, I found myself letting Mariah Carey soothe me. If you’ve never heard her version of “Oh Santa” or seen the retro video, check it out. Hey, don’t feel bad for clicking on the video, Christmas is only ten months away! Don’t think too hard and don’t Google it. What artist has had the most Top Ten hits on the Billboard Hot 100? Could it be Elvis? The Beatles? Madonna? Whitney Houston? Michael Jackson? Mariah Carey? Janet Jackson? With “Love On The Brain” moving into the Top Ten this week on the Billboard Hot 100, Rihanna is now in third place in music history! It becomes her 30th Top Ten hit on the Billboard Hot 100 and she didn’t scored her first until 2005! So, who’s ahead of her? In second place with 34 Top Ten Hot 100 hits, it’s The Beatles. Their first was “Love Me Do” in 1962 (it hit #1) and their last was “Free As A Bird” (peaked at #6) in 1995. And, in first place, it’s Madonna, with 38 Top Ten hits! Her first Top Ten hit was “Lucky Star” (#4 in 1984) and her most recent was “Give Me All Your Luvin'” (with Nicki Minaj and M.I.A.) in 2012. It peaked at #10. Behind Rihanna for the most Billboard Hot 100 Top Ten hits are Michael Jackson in 4th place with 29 and Stevie Wonder is in 5th place with 28. Elton John, Mariah Carey, and Janet Jackson are tied in sixth place with 27 Top Ten Hot 100 hits and the Rolling Stones, Whitney Houston, and Paul McCartney are in ninth place with 23. By the way, Rihanna was just named Harvard’s “Humanitarian of the Year” and will be appearing in the final season of “Bates Motel”, now airing on A&E, as Marion Crane, Janet Leigh’s iconic character from the original “Psycho” movie! Ah, the weekend is here again and to kick it off, here are a few of my random thoughts. I appreciate you checking them out and have fun this weekend! LESS THAN THREE WEEKS AWAY — THANK GOD! Regardless of which candidate you support in this year’s presidential election, I’m sure most of us agree that we can’t wait for November 8th to get here so we can vote and put this long, nasty campaign behind us! The three presidential debates between Hillary Clinton and Donald Trump are history and a CNN/ORC poll conducted after each debate shows that Clinton won all three by margins of 35%, 23%, and 13%. After watching the first two, I decided that I could not and would not subject myself to another ninety minutes of watching an immature and unprepared old man act like a child. And, did I call that one correctly? 21 seconds into video proves me right! My summation: An adult is talking and a spoiled brat without manners interrupts and starts name calling. Said grown adult maintains cool – PRICELESS! This Christmas will mark the 20th anniversary of the shocking death of 6-year-old JonBenet Ramsey in her Boulder, Colorado home. Two decades later, there have been no arrests, but there’s widespread speculation about who killed her and how and why she was murdered. I just finished reading “Perfect Murder, Perfect Town” by Lawrence Schiller. If you want to know more about the investigation instead of just the soundbites you remember from the news two decades ago, this is a well written and well researched book. Here’s what I took away from the 600-plus pages: There were many dedicated and thorough detectives working to solve the crime, but the murder investigation (that was called in as a kidnapping) was pretty much botched from the beginning with police failing to secure the crime scene, there was a major disconnect between the Boulder Police and the district attorney’s office and this made each side look like amateurs to the nation and the world, and finally, that unless someone confesses one day, the case will never be solved. Be careful who you accuse of murdering JonBenet. On October 6, 2016, her brother, Burke Ramsey, who was nine at the time of her death, filed a defamation lawsuit against Dr. Werner Spitz, who accused Burke of killing his little sister. Burke and his attorneys are seeking a total of $150 million in punitive and compensatory damages. They may also be filing new lawsuits against CBS soon. Burke, now grown, agreed to an exclusive interview with Dr. Phil to talk about his life and sister’s murder. 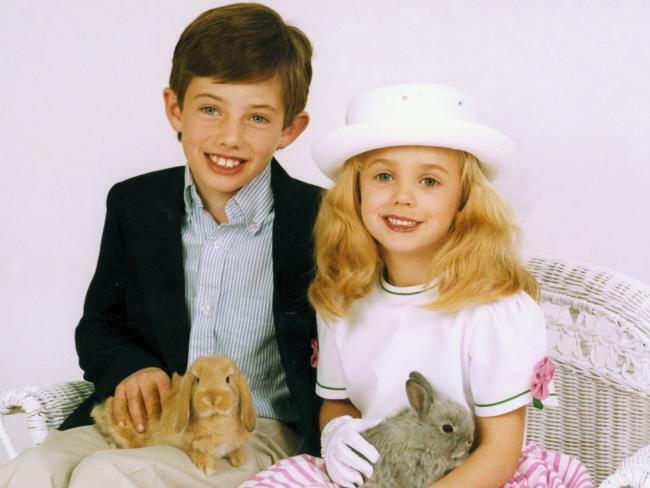 While Burke, his family, and their friends should be presumed innocent in JonBenet’s death until proven otherwise, one thing that Burke is guilty of is being rather creepy and unnerving in the interview. You’re talking about the savage murder of your little sister on Christmas Day and you’re sitting there smiling like you’re unstable or medicated. That’s just an observation. It was awkward. No one really knows what happened Christmas night 1995 in the Ramsey’s Boulder mansion. No one, that is, but the killer(s). But, as I mentioned above, almost everyone following the case then and now, have theories on who killed JonBenet. After reading Schiller’s book, I feel I know a little more than the average person following the murder. I definitely know more than I did twenty years ago. A family comes home from a Christmas party and before their two children go to bed, one wants a snack. While the older child is eating from a bowl of fruit, the younger sibling grabs a piece from the bowl and pops it in her mouth and runs off. The older child grabs a flashlight from the kitchen counter and a foot chase ensues. The older child strikes his little sister in the head with the flashlight. This blow is not intended to kill, but to put the younger child in her place. The parents put the children to bed, but realize that something is wrong when the little girl becomes unresponsive. At that point, instead of taking the younger child to the hospital or calling 9-1-1, they panic and stage a crime scene to cover up the accidental, unintentional death. This isn’t far-fetched. I grew up with a little sister two years younger than me and we definitely had our fair share of arguments and fights growing up. *The story, all names, characters, and incidents portrayed in this production are fictitious. No identification with actual persons (living or deceased), places, buildings, and products is intended or should be inferred. 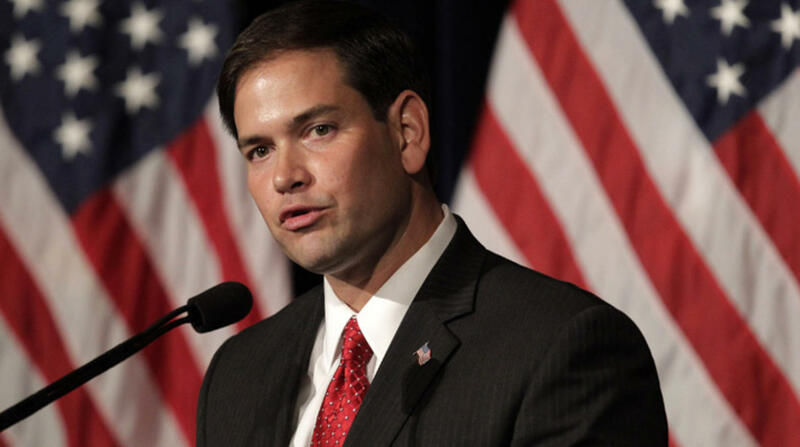 In the past, I’ve blogged about how much former Republican presidential candidate Marco Rubio scares me because of his LGBT views. While I still want to keep him at arm’s length, he has come around and spoken out on a couple of issues that Republican politicians and their supporters need to face. First, Rubio is disputing Donald Trump’s claims that this year’s election is rigged. Here’s what I had to say about Rubio in a blog earlier this year when he was still a contender in the Republican race for the White House. Former Republican presidential candidate, Ohio Governor John Kasich also disagrees with Trump in thinking the election is rigged. MAYBE WE SHOULD ASK HEATHER MOONEY HER THOUGHTS! “The Walking Dead, one of the best shows on television, returns for its much anticipated seventh season Sunday night. When the season six finale ended, baddie Negan and his barbed-wire covered baseball bat, Lucille, bashed to death a major cast member! With all the allegations of sexual misconduct by several women against former Fox News CEO Roger Ailes, I guess anchor Shepard Smith coming out as gay earlier this week is no big deal. Personally, I thought he already identified publicly as gay! It’s almost 2017 and a person’s sexuality should never be what defines them. Some may even ask, why should we care? It’s his business. I think it’s important for people, even at Smith’s age (early-50s), to have role models if they feel they’re living a lie or can’t be themselves by staying in the closet. Come out, come out! It’s freeing and it’s liberating. My favorite new comedian and satirist Samantha Bee drives home another winning commentary on the Donald Trump and Billy Bush recording! You know the one that started the debate on kissing and grabbing whatever you want — if you’re a celebrity (or Trump). Oh no! You’re going to hear the p-word again and according to Samantha Bee, that word isn’t “presidential”. This is too funny and I’ve never even heard some of these expressions! I sure hope Samantha is still as funny after the 2016 presidential election is over in just under three weeks! 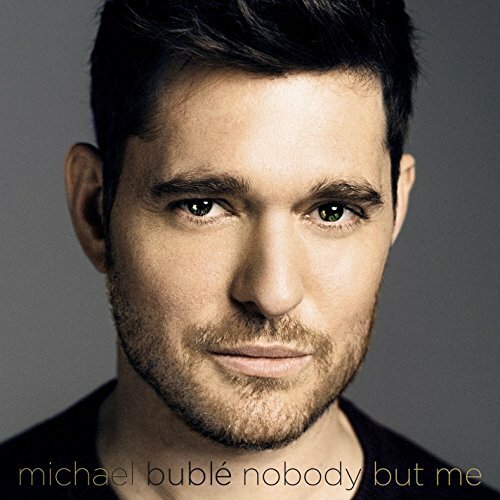 For Michael Buble fans, it’s been a long wait for his ninth studio album (seventh major label release), “Nobody But Me”. The three-and-a-half year wait is over. 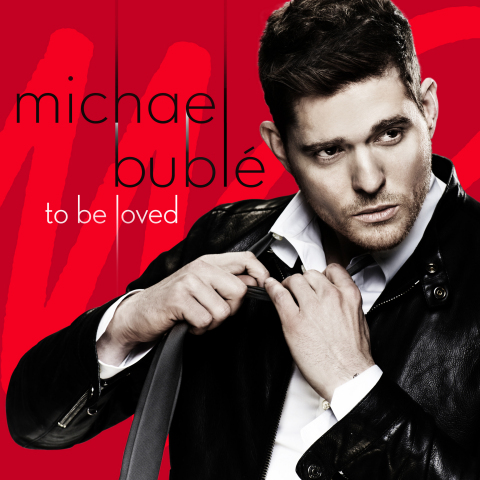 While I enjoyed his early 2013 release, “To Be Loved”, the new album is fantastic! My early favorites are “I Believe in You”, “On an Evening in Roma (Sott’er Celo de Roma)”, “Today is Yesterday’s Tomorrow”, “God Only Knows”, “Someday” (a duet with Meghan Trainor), and the title track. Here’s the first release from the album. While I featured the lyric video some time ago, the “official” video just came out last week. When it comes to mainstream movies, there are Oscar worthy ones, some great ones, and some that true turkeys (and not the Thanksgiving kind). You know the ones — the ones that remind you that you’ll never get those two hours of your life back. It’s even harder to find those gems in the LGBT movie genre because there are fewer of them being made. When I saw the trailer for “Waiting in the Wings: The Musical”, I thought it had potential to be funny. I also knew that it could easily leave the rails. The musical is written and directed by Jeffrey A. Johns, who’s also the star. Johns plays Anthony, a small town Montana man who lives for musicals (and Disney). He enters an online contest and heads to New York to make his mark on Broadway. However, there’s a casting mix-up and Tony, a stripper (played by Adam Huss, who was also entertaining in 2010’s “Is It Just Me?”), gets Anthony’s role and naive Anthony has to learn to strip. The movie also features Lee Meriwether in a touching and supporting role. Shirley Jones and Sally Struthers also make cameos. I really fell in love with Rena Strober, who plays Rita, the lead in an Off-Broadway play. She gets to play sweet and catty, but most of all, her voice is incredible. Yes, you have to suspend disbelief at times, but isn’t that why we watch movies? My only complaint is that Rebekah Kochan is underutilized. She was so crass and so much fun in Q. Allan Brocka’s “Eating Out” movies. HE REALLY IS INVINCIBLE — EVEN IN DEATH! Michael Jackson died more than seven years ago, but he’s still the top earning dead celebrity. In 2016, his estate earned $825 million! $750 million of that is from the sale of his half of the Sony/ATV publishing catalogue. Back in 1985, Jackson paid $47.5 million to buy the original Beatles-packed ATV. At #2, with $48 million, is “Peanuts” (and Charlie Brown) creator Charles Schulz. Golf legend Arnold Palmer came in third with $40 million. Elvis Presley ($27 million) and Prince ($25 million) round out the top five. Okay, back in 1986, in my formative party years, we knew all about those “nasty boys” thanks to Janet, Miss Jackson, if you’re nasty. I’m starting off with a quick thank you for taking the time to check out my blogs when I share new ones and for your comments. I miss writing every day. Since my new blogs are not regular, fewer people check them out. But, I appreciate each and every one of you that reads them. And, as always, feel free to share your thoughts — if you agree with me or disagree. Just tell me why and do it diplomatically. A new British made-for-television movie, “Elizabeth, Michael, & Marlon”, focusing on a road trip that Michael Jackson allegedly took with Elizabeth Taylor and Marlon Brando after the 9/11 attacks in 2001 is getting a lot of buzz. I say “allegedly” because this incredibly hard to believe story was disputed by “Vanity Fair” magazine in 2011. “The Guardian”, a British daily newspaper, is reporting that Joseph Fiennes, who won praise and several awards for 1998’s “Shakespeare in Love”, will be playing Michael Jackson! Wouldn’t the Oscars just love this!!!!!!!!!!!!! I remember him very, very well as the naughty Monsignor Timothy Howard on “American Horror Story: Asylum” in 2012-2013. Stockard Channing is reportedly playing Liz Taylor. WHAT WOULD MICHAEL THINK ABOUT THIS? In a 23-year-old interview with Oprah Winfrey, she asked the legendary singer about rumors of him wanting a white kid play him in a Pepsi commercial. I guess he wouldn’t approve of Fiennes! For two years in a row, the Academy of Motion Picture Arts and Sciences (the Academy Awards) failed to nominate an actor of color in the acting awards — that’s 20 white people two years running. I’m not a fan of “Saturday Night Live”, but they can get it right and when they do, it’s too funny. Like music and movie charts and stats, I love polls and numbers when it comes to big elections and this year’s presidential election will be a big one. I’m excited about Monday’s Iowa Caucus, the first vote in the nation for the next president of the United States, for two reasons: (1) to see who wins and if the polls were correct and (2) so we’ll hear and see less of the so-called candidates that never stood a snowball’s chance in hell of winning! Earlier in the week, I posted a really interesting blog about why the race for president is much bigger than Iowa and New Hampshire and how diversity across the U.S. will have a bigger impact on the nominations. The day after I shared it, “Real Clear Politics” had a similar story. Now that you’ve read it, do you agree or disagree? DONALD TRUMP CAN GET AWAY WITH MURDER? Maybe he could get a show on ABC since NBC got rid of him! And, technically, he didn’t say he could kill someone. This isn’t Russia and he’s not Putin, it’s not Germany and he’s not Hitler. Nevermind, I can’t prove who he is and who he isn’t! I just know that even my Republican friends across the aisle can’t think that he’d be good for America no matter how much they hate President Obama and dislike the Democratic candidates and the Republicans running against Trump. Remember this former Monday feature? Sometimes you just have to smile and make the best of the trainwreck that is Sarah Palin and Donald Trump. Her endorsement of the Republican front runner is rather entertaining! Okay, this version is fun. Thousands of flights were “cancelled” last weekend with the epic blizzard across the mid-Atlantic and the northeastern United States. Even when school are delayed or “canceled” locally, you see the spelling both ways. Which do you prefer, since both are correct? I’m old school and I like “CANCELLED”. PANDA IN SNOW — LOVE IT! While I know the historic snowstorm wreaked havoc for millions and, sadly, killed people, you have to find the beautiful of it. This video from the Smithsonian’s National Zoo in Washington D.C. made my weekend last weekend. Tian Tian (tee-YEN tee-YEN), the male giant panda, loved playing in the snow. The zoo says “giant pandas have thick woolly coats that keep them warm in the snowy mountains of China”. Since we’re talking snow, I finally got to see a movie that I’ve been wanting to see for well over a year now. “Force Majeure”, a 2014 Swedish film, that was nominated for a Golden Globe Award for Best Foreign Language Film, is funny and serious. A family of four are vacationing for a week in the French Alps. One day at a patio lunch, a controlled avalanche rolls down the mountain dangerously close to where they’re sitting blasting them with snow. In the pandemonium, as vacationers run from the patio, the father, Tomas, rushes from the scene leaving his wife, Ebba, to get to two children to safety. It’s only a false alarm and they go back to lunch with snow on the patio. But, things have changed. Did Tomas really run and leave his family and how will he and Ebba deal with the aftermath as a family? After seeing the movie, I wish that Johannes Bah Kuhnke, who plays Tomas, would do some American movies. Last Friday night, with Ray in New Orleans, Gretel, our 14-year-old daughter, and I had a dad and daughter weekend. It started at the movies with a large popcorn and two large Coke Zeros with a splash of cherry! She’s read “The 5th Wave” novel and was looking forward to the movie starring one of her favorite actresses, Chloe Grace Moretz, and one of her crushes, Nick Robinson (“Jurassic World”). It’s a young-adult end-of-the-world movie about aliens taking over the world in a catastrophic waves. While the U.S. box office results for opening weekend were weak at $11 million, part of that may have been due to historic snowstorm on the East Coast. Foreign box office returns are stronger and the movie has, at least, made back its $38 million budget. I CROSSED THE AISLE TO BE FAIR, BUT HE SURE ISN’T! If you’ve read my blogs and thoughts on a regular basis, you know that I’m a Democrat and that I support Hillary Clinton. However, this random thought is about being open-minded and crossing the aisle and reading books by a couple of Republicans. I started with two-time failed presidential candidate and former Arkansas Governor Mike Huckabee. I enjoyed the six-page Prologue, “I Love Iowa! January 3, 2008”, which focused on the Iowa Caucus that he won keeping him in the presidential race that year longer than expected. After that, it was all downhill! It was filled with his anti-Democrat, anti-gay rhetoric, and his holier than thou religious life. I’m perfectly fine that people love God and want to talk about it. I pray to God every night and thank him for all he’s blessed me with in life. Huckabee starts one chapter about “all men are created equal” and later in the book, on protecting human life, he states, “I do pray that one day we will be clear as to the value and worth of each and every human life”. What baffles me is the hate he then spews in the name of his love for God. It fully contradicts those comments. The book is not very cohesive — it’s all over the place. In the middle of talking about abortions and being pro-life, there’s a couple of paragraphs about how repulsive slavery was. It was! However, that was awkward place for it. Couldn’t it have its own chapter? Technically, it may have never happened before. But, I’m sorry Mike, that’s not history-worthy and it won’t be remembered by anyone other than you and your family! As I stated, the Prologue was interesting and then when he talked about FairTax, he got my attention. I can say I gave him a chance and I was hoping to see where he developed so much hate for me and my family and the rest of the LGBT community. Move on Mike. Your 2016 presidential run is DOA and Iowa doesn’t love you like it did in 2008. Go home to your family and retire. I’m going through my movies and CDs and downsizing. I came across the self-titled debut from Hanna-McEuen (cousins Jaime Hanna and Jonathan McEuen) from the fall of 2005. The first single from the album, “Something Like A Broken Heart” is a great song and Jaime’s voice is incredible. Sadly, it only made a blip on country music radio peaking at #38. I’m hoping Hanna’s good looks weren’t what prompted me to buy the CD. Nevermind, I already said his voice is incredible. By the way, he’s currently playing in Gary Allan’s band. Gary is a great guy. I had a chance to interview him in Lubbock, Texas, as we were both starting out in our respective professions, back in 1996. He was enjoying his first hit, “Her Man”, which reached #7. Gary has now scored 23 country hits, eleven have gone Top Ten, and four have hit #1. His first was “Man To Man” from the 2001 “Alright Guy” album. Gary is coming to the area to Davenport, Iowa, August 3, 2016, to the Mississippi Valley Fair. I also came across another self-titled, one-hit wonder, Katrina Elam of Oklahoma. She reached #29 on the country charts with “No End in Sight”. While that was her only Top 40 country hit as a singer, she’s written Top Ten hits for Rascal Flatts (“Easy”, #2, 2011) and Hunter Hayes (“Invisible”, #4, 2014), and songs for Carrie Underwood and the Eli Young Band. Reba McEntire did a remake of Elam’s “I Want A Cowboy” on her 2009 “Keep on Loving You” album. I hope you found something interesting here. If something got you thinking, share your thoughts with me and have a great weekend! Sometimes when driving in to work, I listen to CDs and sometimes I just flip through the programmed channels on the radio. Today, I heard the two latest hits from Taylor Swift and Justin Bieber and that was just in a 15-minute drive. That prompted me to write today’s blog. On today’s drive, I didn’t know that legendary music icon David Bowie had died peacefully in his sleep after a long battle with cancer just two days after his 69th birthday. I learned that when I logged on to my computer at work. And, I thought back to last week when I heard “Let’s Dance” on my drive to work after a local station abandoned the Christmas music format. I was a fan of Bowie’s 1980s music and “Modern Love” was one of my favorites. In his passing, I was reminded of the strong conviction of his standing up for his beliefs and questioning the system when it wasn’t welcoming to all. Here’s a short read on Bowie questioning a MTV VJ about why the network didn’t feature black artists. Michael Jackson would one of the first that benefited from the inclusion. At 51, I’m not ashamed to say that I love Taylor Swift and Justin Bieber, who are 26 and almost 22 years old, respectively. In the early 1980s, I’m sure there were 51-year-olds, that screamed for Elvis, the Beatles, the Rolling Stones, and David Bowie in their youth, loving the same music as me. When I was in my teens and early 20s, I idolized Madonna, Erasure (Andy Bell and Vince Clarke), Boy George and Culture Club, Duran Duran, Pete Burns of Dead or Alive, and the Pet Shop Boys. They were either the same age as me or maybe a few years older. The point is, while I was in heaven with the fantastic dance music coming out of the 1980s, people decades older than me were enjoying the same sounds and probably weren’t ashamed to admit it. That’s why many of those artists are still making some of the best music of their careers. Top 40 radio just doesn’t know it! So, if you’re checking this blog out and you’re about Taylor and Justin’s age, take a moment to enjoy my generation’s superstars. You’ll likely enjoy it and know that age doesn’t matter. Enjoy life and music, regardless of your age or the age of the singers you’re listening to! It’s great to have Janet Jackson back making new music and touring the world. As soon as she announced her “Unbreakable World Tour” this summer, I bought tickets to her show in Omaha, Nebraska, the day before Halloween. It was a treat and definitely not a trick. After four postponed shows due to strain on her voice, Janet returned to the stage for her first show back in Omaha and fans, including myself, were definitely dazzled. For Janet fans since her first Top 40 hit, “What Have You Done For Me Lately” in 1986, she packed so many chart smashes into her 90-minute set. Yes, many were included in medleys and you only heard bits and pieces of the song. However, that worked for me. When you have artists like Janet (and Madonna) with 30 years of countless hits, you would miss so many of them if they performed the entire song. So, the medleys worked for me even if I would have loved to have heard some of the complete songs. The show was lively and fun. There was so much energy during the upbeat dance numbers and Janet and her dancers took advantage of the stage to keep the party going. When she performed slower numbers, she was mesmerizing and captivating. Janet only performed five songs from her latest album, “Unbreakable”, but the song selections were amazing, especially “After You Fall”, “Shoulda Known Better”, which was accompanied by a very powerful, moving video, and “Burnitup!” with the legendary Missy Elliott, who’s ready to drop her own new single, “WTF (Where They From)”, soon! 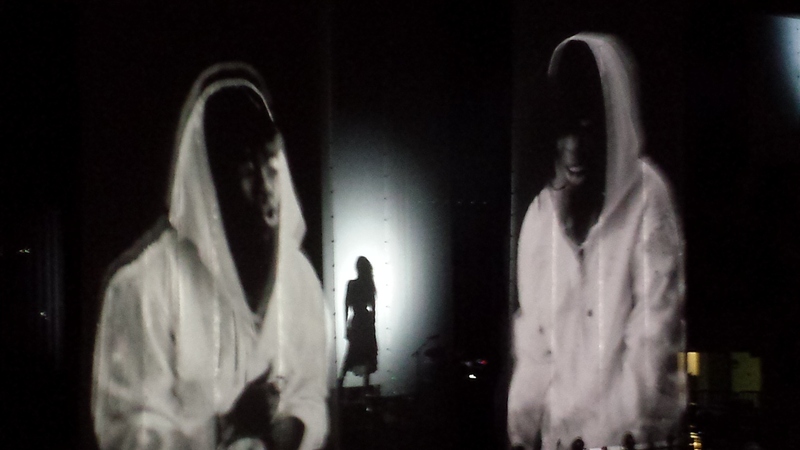 I think my favorite part of the show (if I had to choose just one) was when she performed “If”. 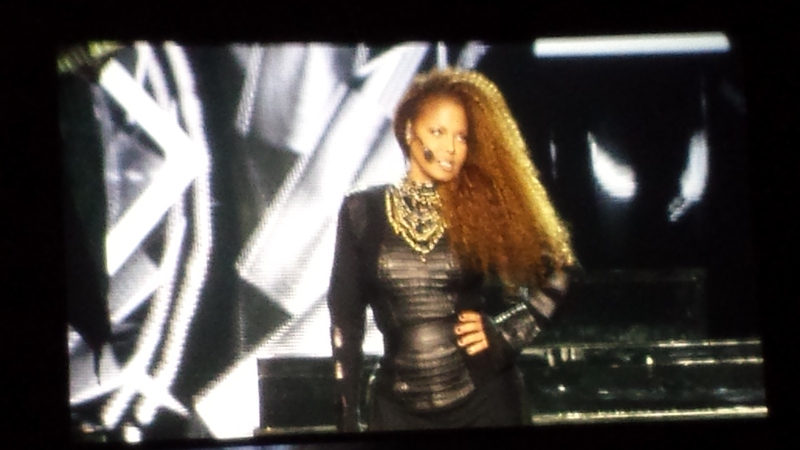 At the end of the show, Janet thanked the fans for the continued support not only for herself, but for her family. A couple of times during the show, Janet pointed a finger to heaven and smiled to her brother Michael — proof that family means everything to her. If you’re a Janet Jackson fan, this show is not to be missed. Janet will be playing in my city, Moline, Illinois, at the iWireless Center, next summer and I hope to see the show again. And, Janet, from what I’ve seen, you wear black sometimes and white at other times. If I get to see you in Moline, I hope you’re wearing white this time so I can get the best of both fashion worlds. 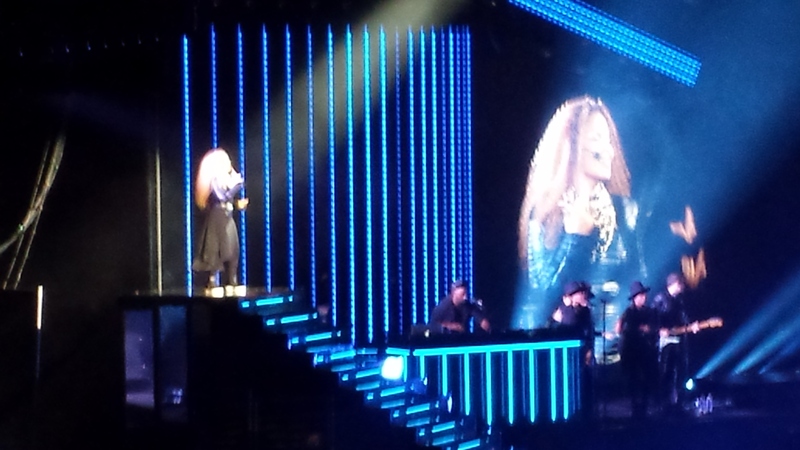 On the day I saw Janet in Omaha on Halloween Eve, I blogged my 20 favorite Janet Jackson songs and I’m sharing that link here, too. Let me know which of your favorites didn’t make my list. P.S. I just love “Burnitup!” so much I’m including the lyric video, too.